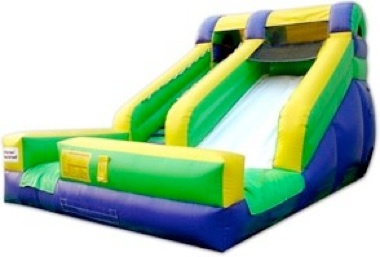 Party Rentals in Western MA has the best prices on waterslide rentals in Western Mass. 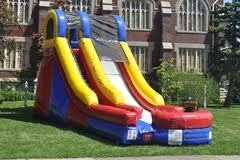 We are the leading provider of waterslide rentals to Springfield MA. Our water slide rentals are sure to be a hit at any summer party! Our high quality commercial grade slides will have adults and kids sliding down into a cool pool of water. There’s no better or more fun way to cool off on a hot summer day. Rent our most popular and largest slide The Big Kahuna Waterslide Rental and your party is sure to be the envy of the neighborhood. The Big Kahuna stands at an impressive 17 feet tall and 35 feet long. It is most popular for high school graduations, and older kid birthday parties but it is still suitable for the younger kids as well. The Green Splash Waterslide Rental is great for the younger kids but any older kids at the party will still have a blast going down the waterslide. The Patriotic Splash is a budget friendly Water slide rental in between the Big Kahuna and Green Splash Waterslide. 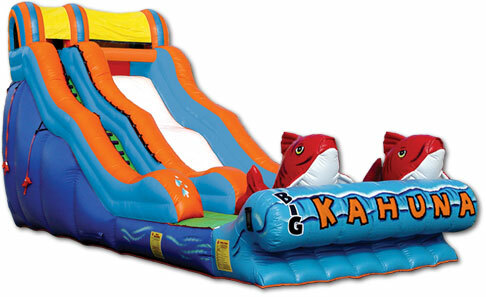 With three different size waterslide rentals you are sure to find one for your party and budget! Bounce House Rentals in Springfield Massachusetts guarantees the lowest prices on waterslide rentals if you find a lower price from another licensed company we will beat them! Call today to reserve these waterslide rentals don’t last long in the summer!